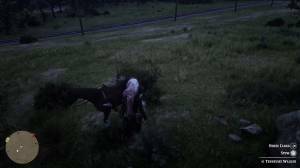 After skinning the animal, you can load the carcass to your horse and bring it back to a trapper or butcher to sell it or back to the camp where you can donate it for provisions. If you intend in selling or donating the animal’s carcass, it’s better to stow it unskinned first then carry it to the butcher or back to camp. You can then skin it before selling/donating it. Small animals like squirrels, frogs, small birds, rats, etc are stored whole in your satchel. Two small animals like large birds, turkeys, raccoons, rabbits, etc. They are stowed on each side of your horse. One medium to large animals like foxes, deers, wolves, alligators, snapping turtles, large fishes, etc are stowed at the back of your horse. Several layers of pelts and skins can be stacked on the horse’s rear. Even if you have a carcass stowed at the back, you can still slide in more pelts underneath. Rolled pelts from large animals like bisons, alligators, moose, elk, etc are take up the whole rear stowing space so you can’t store large carcasses when you have these large pelts loaded. 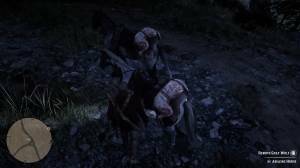 You can double the amount of your horse carrying capacity by bringing another horse. Since you can only get one of your stabled horses at a time, the only chances that you’ll get another horse are by getting someone else's or breaking one from the wild. You can load the same number of animals and pelts in the other horse. Only one of these horses can have your saddle (with your weapons and other cargo are stored) so the other horse will only serve as a mule. 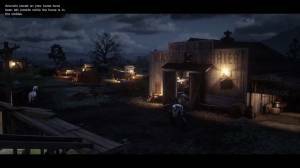 If you enter a stable with an extra horse loaded with carcasses and pelts, you'll have to either stable that extra horse or sell it. The carcasses and pelts it is carrying will be dumped outside the stable for you to recover.